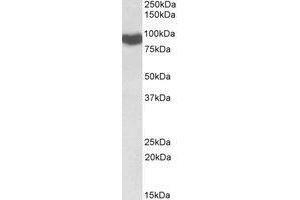 AP21520PU-N CYPOR antibody staining of Rat Liver lysate at 0.1 µg/ml (35 µg protein in RIPA buffer). Primary incubation was 1 hour. Detected by chemiluminescence. Specificity Recognizes Cytochrome P450 Reductase (CYPOR). Cross-Reactivity (Details) Species reactivity (expected):Dog, Cow, Pig, Rabbit.